Julie Ter Borg is a jewelry artist and the owner of Julie Ellyn Designs Handmade on Main, located at 18 South Main Street. 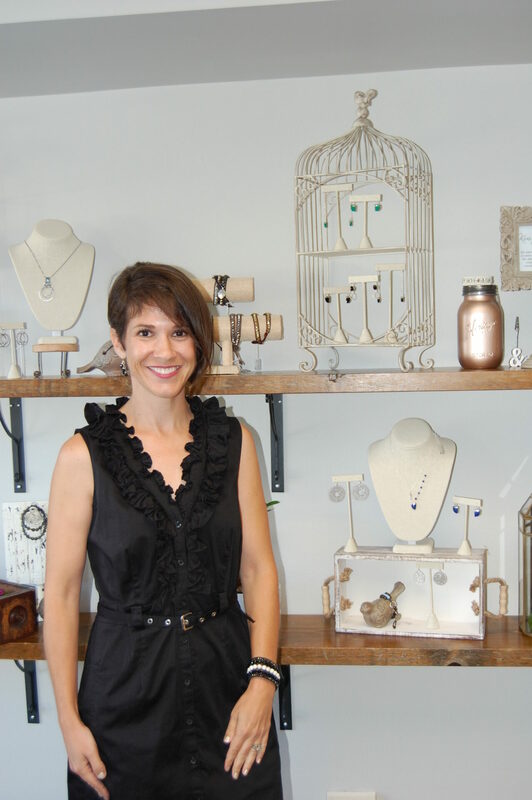 We sat down with Julie recently to talk about her business on Main Street in Bel Air and her amazing handcrafted jewelry. I started making jewelry when I was in graduate school for stress relief…almost 20 years later it is now my full time business! Turning a hobby into a business and “quitting my day job” is a dream come true! What do you love most about making jewelry? Besides playing with exquisite gemstones and dreaming up beautiful color combinations and designs, my favorite thing about making jewelry is seeing people wear my creations. It still stops me in my tracks when I encounter people wearing things that I made! Your shop features your own beautiful work but you have also made room for lots of other artists’ work. What made you decide to support other local artists in your store? Buying local and supporting handmade is extremely important to me. I grew up on a small farm in Harford County and both of my grandmothers were seamstresses, so handmade and homegrown are a big part of my lifestyle. When I reached the point of opening my own shop, I knew I wanted to give back and help other designers showcase their art and creations. What do you love about being on Main Street? Main Street is so welcoming and supportive. The Town of Bel Air and the Bel Air Downtown Alliance have welcomed Julie Ellyn Designs Handmade on Main with open arms as have the existing shops and restaurants. I am excited to be able to participate in the many activities the town plans throughout the year, particularly the Belle Aire Market and MD BBQ Bash. We hear you offer great workshops in your store! Do you have any special events coming up? The shop has a variety of workshops for all skill levels. This month we have hand knitting, jewelry making, faux fairy gardens, aqua art, and aromatherapy demonstrations just to name a few. Private workshops and birthday parties are also available. Your jewelry has been seen in some pretty famous places! Tell me about where you have been featured and what you have planned. My designs have been featured on Vampire Diaries, Jane the Virgin, The Fosters, Hart of Dixie, Baby Daddy and recently in an article on Huff Post. I’m hoping to continue the trend in 2018 through submissions I have made to Riverdale, Big Little Lies, The Orville, and Fuller House. Your dog, Charlie, has made quite a name for himself on Main Street. Has he been with you long? We rescued Charlie (our shop dog … and the unofficial town mascot…) through House of Hope Animal Rescue, Inc. (HOH) in Elkton, MD last year. My family strongly believes in animal rescue, so when we lost our last rescue Sampson after a long life, we knew we had to save another! Charlie hails from Texas and is the perfect gentleman! He takes his job as shop greeter very seriously! Thanks to Charlie’s good nature, several other dogs have been adopted and fostered from HOH. Thanks to Julie for taking time to share more about her business with us! Stop by and see the work of Julie Ter Borg at Julie Ellyn Designs on Main Street in Bel Air!